The skin is one of the largest and most extensive organ systems of your dog’s body. Together with its accessory structures — hair, claws and related glands — skin shields your dog against infection, injury, water loss and damaging ultraviolet sunlight. And that’s just for starters. Knowing the basics about your canine companion’s skin will help you better understand how to care for your dog’s skin and coat. Like our skin, the three main functions of your dog’s skin are protection, regulation and sensation. Skin acts as a barrier, providing protection from various environmental elements — bacteria, viruses, chemicals, ultraviolet sunlight and more. Not only does skin keep out unwanted substances, but it helps protect against fluid loss and dehydration. 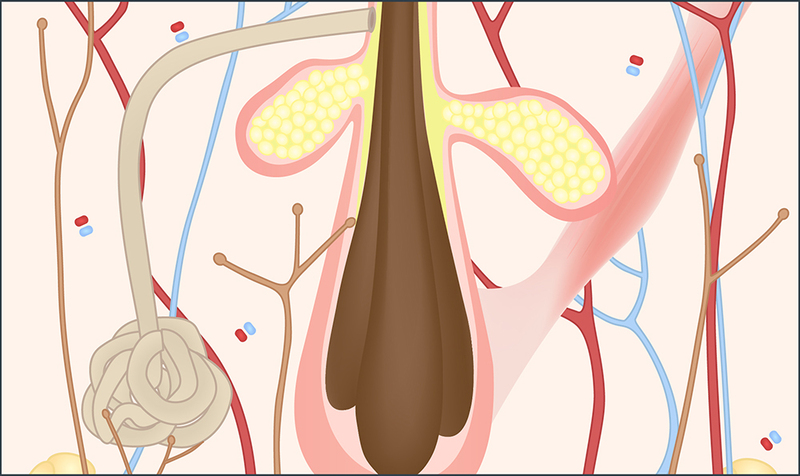 Blood vessels and hair help maintain normal body temperature during hot and cold weather. And skin is where dogs detect different sensations including touch, temperature and pain. Skin consists of two layers, the epidermis and dermis, that lie over a layer of adipose (fat) tissue in most areas of the body. On average, canine skin is thinner than human skin. The outermost skin layer, the epidermis is made up of several layers of cells, most of which progressively fill with a tough, protective protein called keratin as they age. Keratin helps protect the inner layers of skin against water and electrolyte losses, injury and disease-causing invaders such as bacteria, viruses, fungi and parasites. Cells at the top are flat, keratin-filled dead cells that are held together by water-repelling lipids and are continually shed. However, cells at the base of the epidermis are constantly replicating and moving upward to replenish the cell layers above them. A basement membrane anchors the epidermis to the dermis, serves as a protective barrier, plays a role in wound healing and controls nutrient movement. 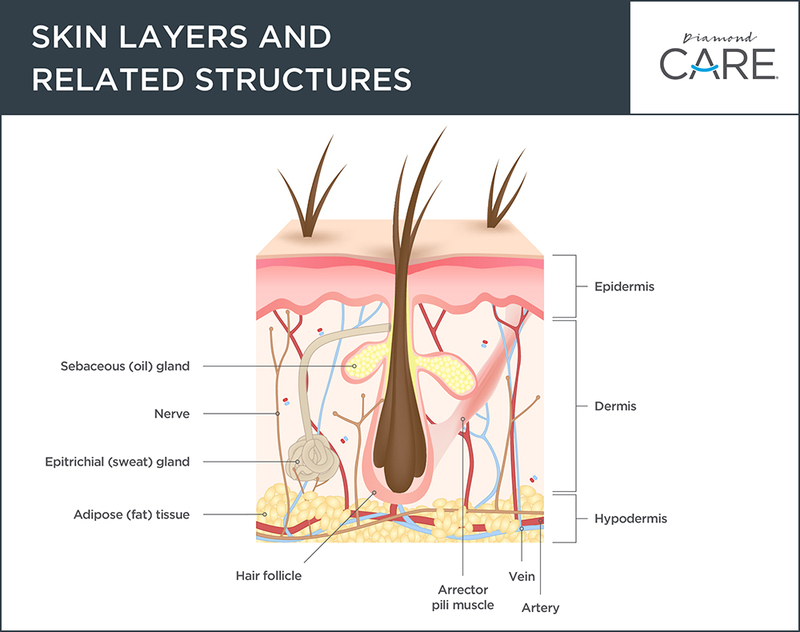 An elastic and flexible connective tissue, dermis makes up the majority of skin. It is responsible for most of skin’s strength, buffering the stresses of movement and maintaining shape. The dermis also contains hair follicles and related muscles, oil (sebaceous) glands, blood and lymph vessels, nerves and immune system cells. The hypodermis isn’t considered part of the skin, even though it connects the dermis to underlying muscles and bones and allows skin to glide over them during movement. It consists mostly of fat (about 90 percent) that provides insulation, stores energy, protects and supports skin-related structures, and absorbs shock. Most dog skin is covered by hair, which plays important roles in protecting the skin from physical and ultraviolet sunlight damage and in regulating body temperature. Unlike us, dogs have compound hair follicles. These follicles have a central hair surrounded by three to 15 smaller secondary hairs that all exit from one pore. Trapping air between secondary hairs helps your dog conserve heat during cold temperatures. Because the skin and coat account for a large percentage of your dog’s body, they affect their need for nutrients. The most common nutrients that seem to benefit the quality of skin and coat are protein level and fatty acids. In fact, skin and hair use the most dietary protein as a result of their constant renewal. So when there is inadequate or poor-quality protein in food, the coat and skin are among the first areas of the body affected. The fat in dog food provides important fatty acids that are valuable components of all cell membranes, including those of skin. Fatty acids are also found in skin oils where they contribute to the luster of the normal healthy coat. When choosing a dog food to support skin and coat health, veterinary nutritionists recommend selecting a food that provides high-quality, highly digestible protein, an optimal ratio of omega-3 and omega-6 fatty acids, vitamins A and E, and zinc. If you have any concerns about your dog’s skin and coat, be sure to talk with your veterinarian.